At AT&T we are passionate in our pursuit of lifelong learning and affording opportunities to others – and we know that adding more options for continued learning will help to create a richer, more diverse class of STEM innovators. That’s why we’ve partnered with Udacity, an online curriculum and credential creator with built in partnerships with leading edge companies, to create the Nanodegree program. The program, named for its compact and targeted curriculum, provides accessible and affordable training for high-demand tech jobs. Launched in 2014, the program has already opened up opportunities for many underserved students as well as AT&T employees. We are supporting the Nanodegree program through AT&T Aspire, our company’s ongoing commitment to prepare learners for success in school and the 21st Century workforce. By making education more accessible and affordable, AT&T can use the power of our network to build a better tomorrow. Our efforts will help more learners gain the skills necessary to overcome income-level and geographical barriers to education. Anyone with the foundational skills and a broadband connection can be a part of the program. What is the content of the Nanodegree program? Front-End Web Developer– Design of internal and/or external user-facing applications. Data Analyst – Analyze and solve real-world problems with data science skills. Full Stack Web Developer – Design functionality of applications including system interfaces. iOS Developer – Designs applications designed specifically for use with iOS. Introduction to Programming – Develop skills that all programmers use whether they program mobile apps, create web pages, or analyze data. Android Developer – Develop basic fundamentals and advanced development skills, as well as Google Play services and Material Design. What’s the status of the Nanodegree program? Nearly 10,000 learners, including more than 1,000 AT&T employees, are enrolled in the following programs including front-end web development, data analytics, iOS development and programming. The program is open to anyone with a solid understanding of high-school level mathematics. Online diagnostic and interviews help ensure that our applicants are studying at the right level and that learning goals align with Nanodegree program outcomes. All courses are designed and hosted by Udacity in collaboration with industry leaders. Most are taught by Udacity instructors and a few by industry instructors. 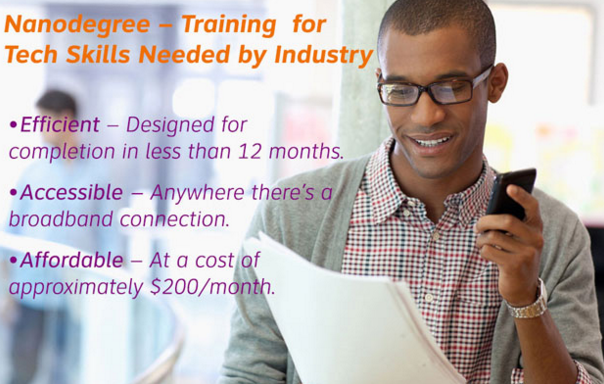 Is AT&T hiring learners who receive Nanodegree credentials? Learners earning Nanodegree credentials will be strongly considered when there is a potential job match. Skills obtained through the Nanodegree program meet AT&T education requirements for certain entry-level technical positions. AT&T has reserved up to 100 internships for graduates of these programs, and we hired our first interns this past summer. See other ways we commit to the lifelong learning and development of our teams.